Regional Finals – Where Are We Now? 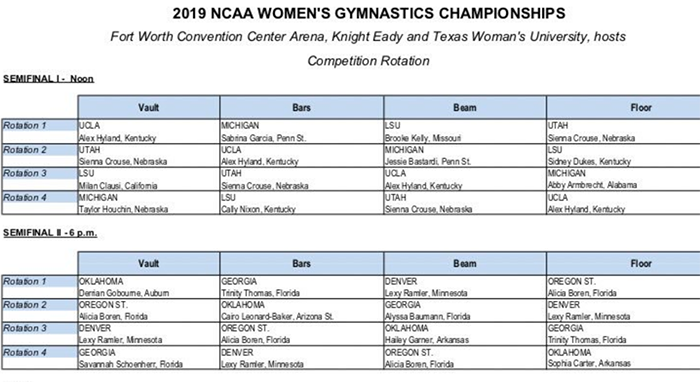 My previews of the regional finals were pretty limited because we didn’t yet know who would be competing in them (although it turns out we definitely did) or what the rotation order would be, so here’s a fresh look at those finals heading into tonight’s competition. The regional with the most charitable judging overall also went the most cleanly to plan, with Oklahoma and Georgia advancing with the highest scores and what appears to be a clear edge over the other two. Oklahoma dominated with a historically high 198.300 (the highest road score ever recorded at a regional—and a tenth shy of the record for highest road score ever, set by UCLA two weeks ago…2019 sure is fun). I think it’s fair to say that Georgia used some home scoring to develop a level of separation over the remaining teams that we wouldn’t have seen at a neutral venue, but you can point to gifts everywhere. What it means is that Oklahoma and Georgia look like your favorites to advance, and Kentucky or Cal moving into the top 2 spots would be an upset. Although we won’t really know what’s up until the last rotation because Georgia finishes on bum bum bum…beam. And it was an adventure even yesterday. Let’s look at this rotation by rotation, using both NQS and yesterday’s scores. Everything is supposed to be going to plan after 1. Given the way vault scoring went yesterday, Cal will feel it can’t be this far behind at this point given how high those numbers were, though it’s worth noting that the judges do move around events for today, so it’s not going to be the same people. Yesterday’s scores would have Cal in second place after 1, which you have to think Cal needs to have a shot. Kentucky had to work against a fall on bars yesterday and was a little 9.7y, and can’t have that again and can’t be multiple tenths back after what should be a pretty good event. Kentucky would be totally OK with this deficit after two events because Georgia is heading to bars and beam in the second half, which is where things would go wrong if they go wrong. Kentucky will feel the opportunity is still alive.